- American Apparel USA Collection Adult Unisex 4.3 Ounce Fine Jersey Short Sleeve T-Shirt. - 4.3 ounce 30-singles 100% ring-spun combed cotton (Heather Grey contains 10% polyester). - Durable rib neckband, shoulder-to-shoulder taping. American Apparel USA Collection Adult Unisex 4.3 Ounce Fine Jersey Short Sleeve T-Shirt. 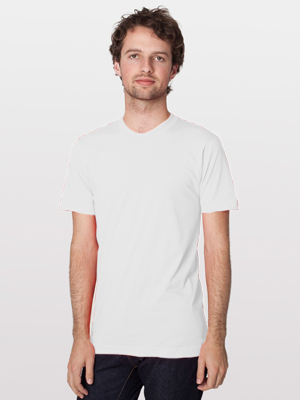 4.3 ounce 30-singles 100% ring-spun combed cotton (Heather Grey contains 10% polyester). Durable rib neckband, shoulder-to-shoulder taping. Sizes XS-3XL: White, Army, Asphalt, Baby Blue, Black, Cranberry, Forest, Fuchsia, Grass, Heather Grey, Kelly Green, Lapis, Navy, New Silver, Olive, Orange, Red, Royal Blue, Slate, Teal. Sizes XS, XL-3XL: Sea Foam (Discontinued. Limited Quantities). Sizes XS, 2XL-3XL: Lemon (Discontinued. Limited Quantities), Summer Peach (Discontinued. Limited Quantities). Sizes XS-S: Eggplant (Discontinued. Limited Quantities), Sunshine (Discontinued. Limited Quantities). Sizes XS, 3XL: Camel (Discontinued. Limited Quantities), Light Aqua (Discontinued. Limited Quantities), Raspberry (Discontinued. Limited Quantities), Truffle (Discontinued. Limited Quantities). Sizes S, 3XL: Creme (Discontinued. Limited Quantities). Sizes XS, 2XL: Light Blue (Discontinued. Limited Quantities), Light Pink (Discontinued. Limited Quantities), Lime (Discontinued. Limited Quantities). Size 3XL: Purple (Discontinued. Limited Quantities). Size S: Ash Grey (Discontinued. Limited Quantities). Size XS: Aqua (Discontinued. Limited Quantities), Ash Grey Seafoam (Discontinued. Limited Quantities), Brown (Discontinued. Limited Quantities), Gold (Discontinued. Limited Quantities), Mint (Discontinued. Limited Quantities), Pink (Discontinued. Limited Quantities), Turquoise (Discontinued. Limited Quantities).